If you were faced with the choice between a swing door and a revolving door, which would you pick? Many people would choose the swing door – maybe because it involves less effort, maybe even because they are a bit afraid of revolving doors! But would you change your choice if you knew that choosing the revolving door would be a way of doing your bit to help save the planet? In 2006, an MIT study found that if everyone used a revolving door to access a particular building, 14.6 tonnes of carbon could be saved every year – that’s enough to heat 5 houses for a whole year, or power a light bulb for 29 years! But, you might be wondering, how exactly does using a revolving door save energy? Well, the design was first patented in Germany, by H. Bockhacker, in 1881. He called it the Tür ohne Luftzug, which translates as “door without draft of air”. He might just have been aiming to prevent that unpleasant rush of cold air when you open a door, but it’s preventing that draft that is the secret to energy saving. Revolving doors prevent what is called The Stack Effect, or The Chimney Effect. This effect happens because warm air is less dense than cool air. So, during the winter, when a regular swing door opens at the bottom of a building, cold, dense air forces its way in and pushes the warmer, less dense air up. The warm air then escapes through the top of the building, reducing the efficiency of heating the building. Similarly, during the summer, the cold, air-conditioned air sinks to the bottom of the building and rushes out when swing doors are opened. So, every time you walk through a swing door and feel that rush of air, you are actually feeling energy leave the building. The 2006 MIT study found that swing doors allow 8 times more air out of a building than revolving doors. That’s a lot of wasted energy, each and every time someone enters or leaves a building. In the case of the building the MIT students used for their study, they found that if every single person who entered and left the building used the revolving door, the building would save approximately 80,000 watt-hours of energy. This kind of energy saving would mean seriously cutting down carbon emissions, (as well as saving businesses a lot of money!) So, if you can manage to overcome that aversion to the dreaded revolving door, or, if you’re a business owner, convince your employees to choose the revolving door instead of the swing door, you could be saving money, as well as doing Mother Earth a massive favour! 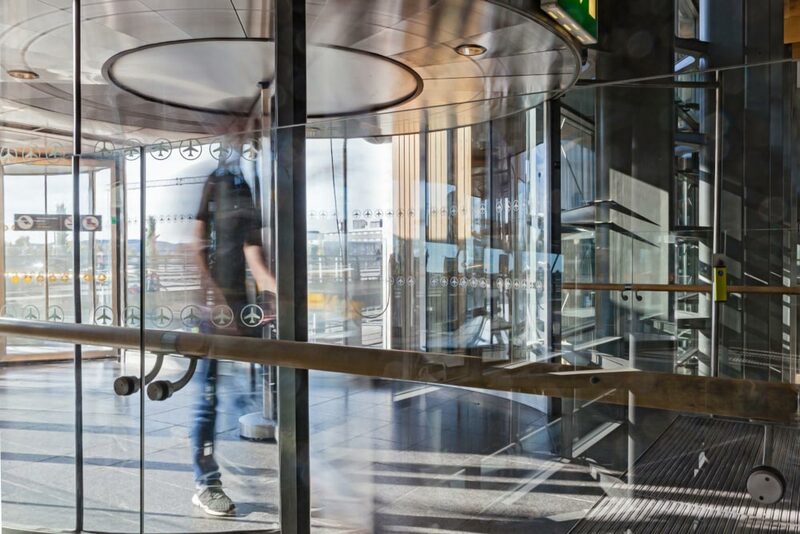 PreviousPrevious post:Uncovering Your High-Security Barrier OptionsNextNext post:11 Reasons Why Irish Businesses are Choosing Revolving Doors. Why Revolving Doors are Important for Your Business in Ireland?